At the opening of the University of Maryland's new Cybersecurity Center, the urgency of its mission was underscored by the ongoing WikiLeaks-related cyber attacks and the announcement of new legislation to create and implement national best practices and standards for cybersafety. Speaking at the Maryland Cybersecurity Center (MC2, or "MC-squared") dedication, U.S. Senator Benjamin L. Cardin (D-Md.) proposed major "cybersafety" legislation. In a keynote address, former U.S. Director of National Intelligence Mike McConnell warned of a "catastrophic" cyber event, likely aimed at the nation's "soft underbelly" - the computer networks crucial to banking and commerce, as well as power, utility and transportation grids. MC2 co-director Patrick O'Shea, chair of Electrical and Computer Engineering at the A. James Clark School of Engineering, replied that the new center stands ready "to answer the nation's call" with an interdisciplinary, comprehensive approach to educating a new generation of cyber leaders and developing advanced cyber policy and technology. Charles “Charlie” Croom, Vice President of Cyber Security Solutions for Lockheed Martin Information Systems & Global Solutions, and Larry D. Cox, Senior Vice President and General Manager of Science Applications International Corporation’s (SAIC’s) Intelligence & Information Solutions Business Unit, also spoke at the event. U.S. Sen. Benjamin Cardin, chairman of the Senate Judiciary Terrorism and Homeland Security Subcommittee, has introduced major legislation that would require the government to work with the private sector to propose minimum standards for Internet and cybersecurity safety. The bill is called The Internet and Cybersecurity Safety Standards Act. "Every computer connected to the Internet, whether a part of our nation's critical transportation or energy infrastructure or sitting in a family living room, is a prime target for cyberterrorists, cyberspies and cybercriminals who want to steal our identities, corrupt our financial networks, and compromise or disrupt key resources," Sen. Cardin said. "Just as automobiles cannot be sold or operated on public highways without meeting certain minimum safety standards, we also need minimum Internet and cybersecurity safety standards for our information superhighway." Keynote speaker Mike McConnell, former director of national intelligence and current executive vice president of Booz Allen Hamilton, warned that the nation almost certainly will experience a cyber "catastrophic event," and that cyber attacks "most definitely" will be part of any future active warfare. Alluding to the WikiLeaks disclosures, he predicted "dot security" networks for classified materials that will be more targeted in granting access to stored materials. The greatest vulnerability, he said, lies in attacks on U.S. banks, commercial operations, utility grids and transportation networks. If a cyber attack brought down a single major bank, it could collapse the whole banking system, he said, with a "bigger economic impact than 9/11." McConnell also noted that "every computer system of intellectual consequence has been infiltrated," draining our intellectual capital. McConnell thanked the University of Maryland for its MC2 initiative, which he said has the advantage of taking a more comprehensive view of cybersecurity, and "not solely technology." MC2 co-director Patrick O'Shea said the new center will apply a more integrated approach and engage in three activities designed to assure the security of the nation's cyber networks: 1) educate a new generation of cyber workers and researchers capable of transforming the system; 2) conduct interdisciplinary research combining engineering and computer science excellence with policy, legal and social science expertise; 3) collaborate with industry and government to develop advanced cybersecurity technology and systems. Lockheed Martin and Science Applications International Corporation (SAIC), are collaborating with MC2 and participated in the launch. The MC2 initiative will build on growing national and state commitments to address critical vulnerabilities of U.S. information systems, including Gov. 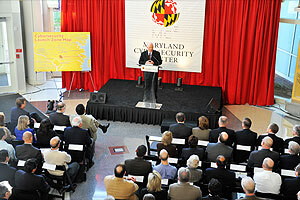 O'Malley's CyberMaryland plan to make the state the "epicenter" of the nation's cyber defense. Video of the Dec. 9th launch event can be viewed online: http://tinyurl.com/2ejeauz or at http://www.cyber.umd.edu.